Marvelous fun to read, often incredible, always authoritative, this is John Brooks at this best--a narrative of extravagant events and extraordinary men. It begins with the famous 1920 bomb explosion outside the Morgan bank. And it ends with an explosion that had far more lasting impact--the conviction for embezzlement of Richard Whitney, last champion of the Old Guard of American finance. Once in Golconda At noon, on September 16, 1920, a horrendous explosion rocked Wall Street, instantly claiming the lives of thirty pedestrians and seriously injuring hundreds more. Yet, for all of its awesome force, that bomb was a firecracker compared to another, much more spectacular one, several years later—the great stock market crash of 1929. 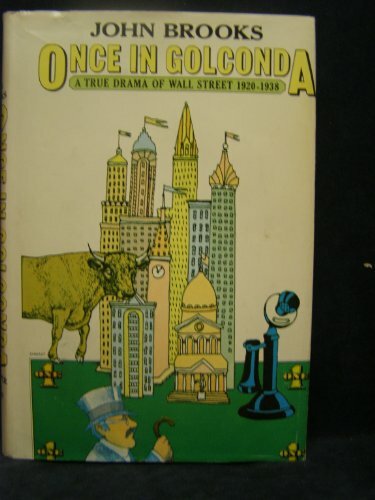 Once in Golconda is a dramatic chronicle of the breathtaking rise, devastating fall, and painstaking rebirth of Wall Street in the years between the wars. Focusing on the lives and fortunes of some of the era’s most memorable traders, bankers, boosters, and frauds, award-winning author John Brooks brings to vivid life all the ruthlessness, greed, derring-do, and reckless euphoria of the ’20s bull market, the desperation of the days leading up to the crash of ’29, and the bitterness of the years that followed. Writing with authority, verve, and considerable humor, Brooks introduces us to a bygone world in which the likes of Junius Morgan and fellow members of the Yankee "aristocracy" jealously controlled Wall Street as if it were their private hunting preserve. He also offers striking portraits of the generation of rawly ambitious newcomers who rose up to topple the old regime, including Irish Catholic "counter jumpers" such as "Sell ’em" Ben Smith and the mercurial Joseph Kennedy who clawed his way up from being one of the most cunning of shady speculators, to first head of the SEC, to king-maker. At the center of this colorful whirlwind of a tale is the magnificently hubristic Richard Whitney. The story of his rise to the presidency of the New York Stock Exchange and his eventual downfall and imprisonment for stock fraud and embezzlement characterizes the play of monumental forces that transformed Wall Street from WASP Camelot to public institution. Though it was first published in 1969, this riveting tale explores timeless themes of profound significance for today’s investors—from the corruption that led to the creation of today’s securities laws to the folly of investor hubris in a bull market.